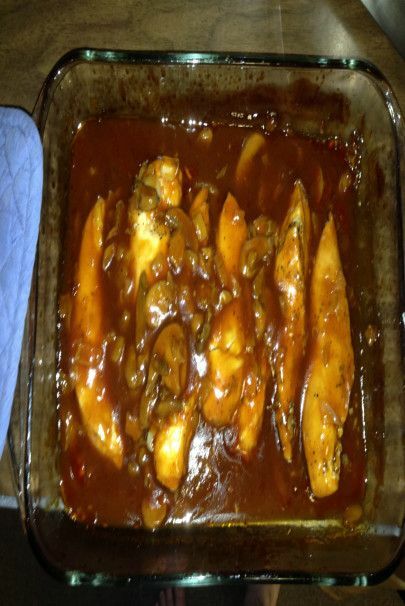 Bake for 20 to 30 minutes or until internal temperature of chicken breasts reaches 165 degrees F. Brush chicken breasts with additional barbecue sauce and serve. For best results, marinate the chicken in oil and seasoning overnight (and barbecue sauce if desired). Move the chicken breasts around a little so that the sauce gets under the chicken as well. Cover with foil and bake for 30 minutes on 350. Remove the foil and let bake another 10 minutes. Remove from oven, let sit for about 5-10 minutes, and then serve hot!